Really nice photo essay by Bill Frakes on ESPN about Brian Hernandez, Jr., who rode McCraken to eighth in the Kentucky Derby. Crowds show up for one reason, to watch you run. 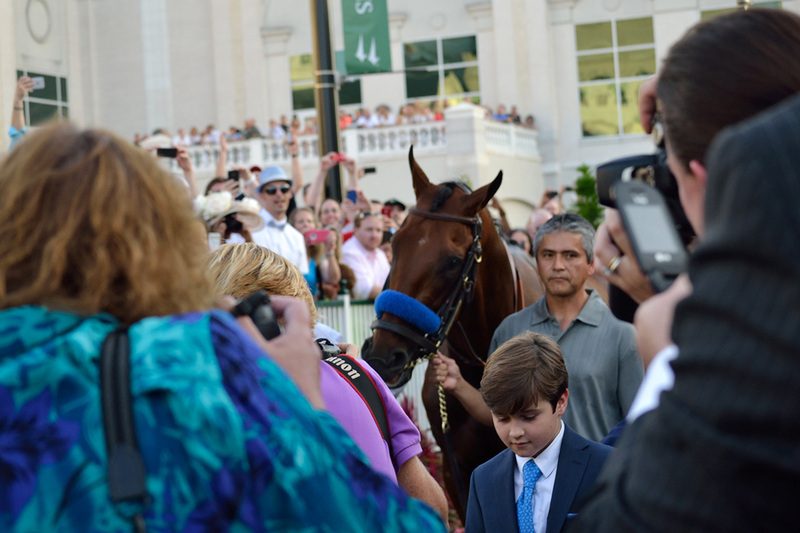 Instead, he was being led over and turned not up the tunnel to be saddled, but kept straight on the grandstand, introduced as “Triple Crown winner, American Pharoah,” to each section, as ovation followed ovation. Entering the paddock, a throng just as large, it seemed, as the one on the frontside was waiting. He passed a man wearing a pharaoh’s headgear. Rows of fans pressed forward on every balcony. 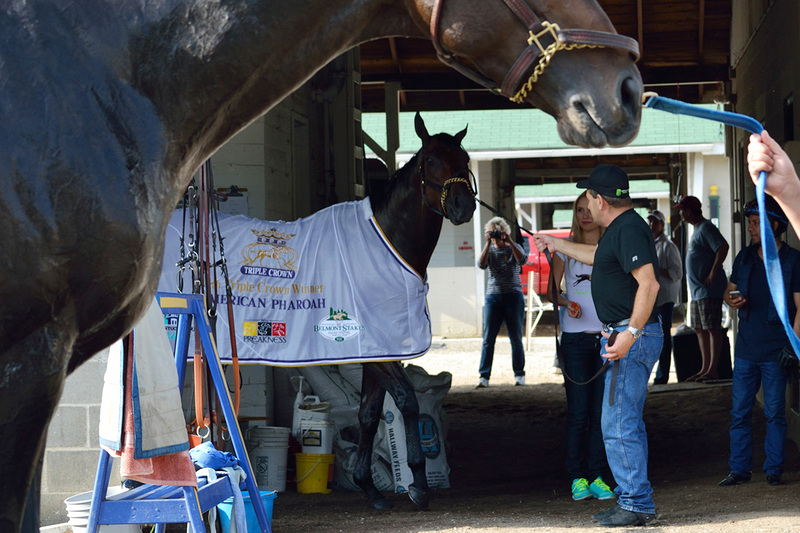 The paddock was full, with fans holding signs and shouting to the horse, as if he could understand. “I’ve waited all my life to see you,” one man said. 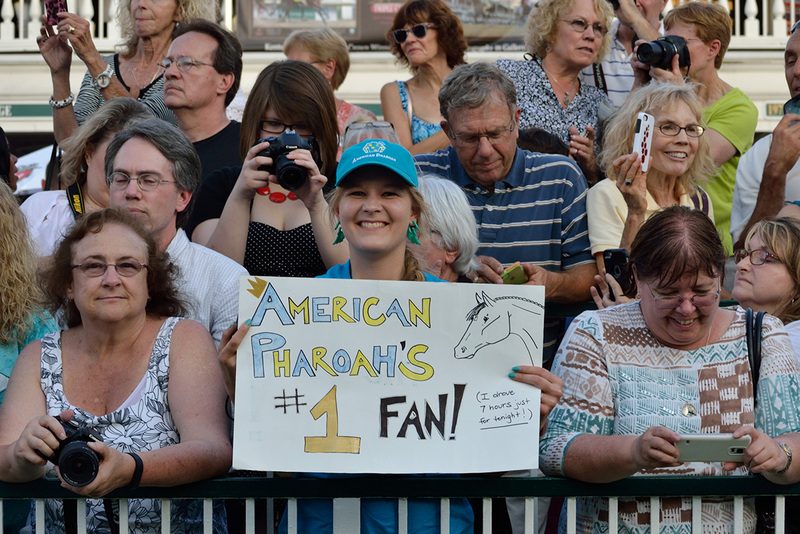 It was something to see, so many people pressing to catch a glimpse of the the 12th Triple Crown winner. The cheering was constant. 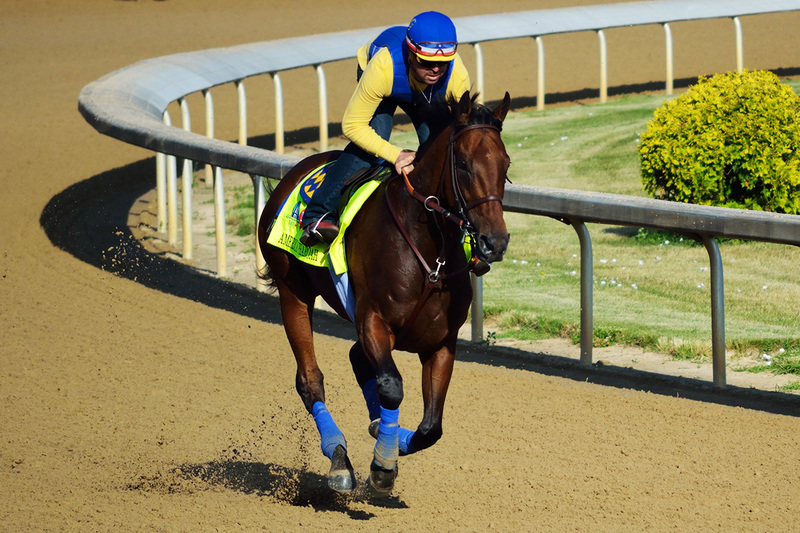 I saw American Pharoah earlier in the day, getting to the backstretch in time to watch him gallop. He was accompanied by a band of fans to the track and back, surrounded by admirers as he was bathed. Everyone was taking pictures. That part I’ve seen before. 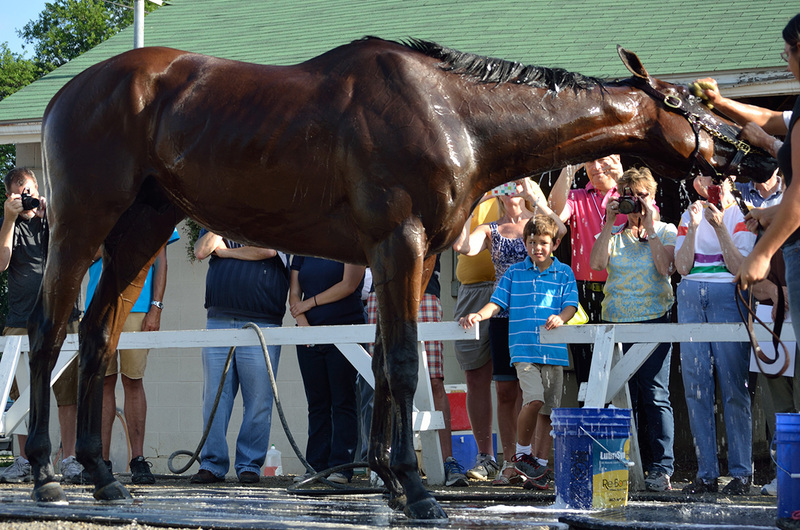 What I never have, though, is what happened next, when his bath was done, and he was led into the barn to walk the shedrow wearing his Triple Crown winner’s blanket — his audience applauded. … we believe the wind and maintenance and distance … combined to make the final time seem even slower than it really was. California Chrome may not have broken any records, but his TimeformUS Speed Figure suggests his Derby was stronger than some may think. I guess we won’t know until after the Preakness Stakes, or possibly later in the year, but I share the sense that his Derby win was better than the figures look, especially taking the wind into account for the first quarter, during which California Chrome had to make use of his tactical speed to secure a position rating off the early pace. He’s the only starter who ran a sub :24 first quarter to finish in the top four — the closest any of the other 10 who did the same finished was fifth, and six in that group finished 14th through 19th. See also: Rob Bingel’s analysis of wind and time in the Derby (PDF) (via). … in this Derby, an incredible 15 of the 19 starters received lower Beyers than they did in their prior starts. In fact, it is incredible when such a large percentage of the field tails off Beyer-wise in any race, and is immediate cause to question the veracity of the winning fig. The revised TimeformUS figure is roughly equivalent to 103 on the Beyer scale, which is still a regression from California Chrome’s previous 107 and 108, but seems a more plausible number than the 97 Beyer given to the Derby. 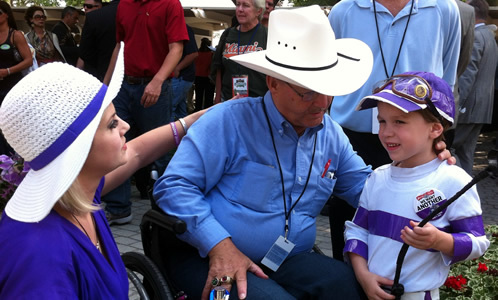 Turcotte talks with a young fan in the Belmont paddock (2012). In 2012, despite being the subject of a National Film Board of Canada documentary being filmed at Churchill Downs, I was denied any parking assistance by the track. If not for the gracious actions of the film crew who had no other choice but to pay Churchill Downs $500 to allow me the “privilege” of on-site parking in a handicapped accessible spot, I am not sure what would have happened. In 2013, despite strong lobbying on my behalf by the Kentucky Derby Museum who hosted my appearance, I once again received no parking accommodation from Churchill Downs and ultimately was forced to park in an off-track neighborhood lot across Central Avenue. Making matters worse, I was then informed that Churchill Downs policy restricted my access to the Museum grounds only, preventing me from even being able to watch the race I had won twice. Oh, who’s Turcotte? Just the guy who won the Triple Crown with Secretariat. I’m trying to imagine another sport treating one of its legends shabbily. If there’s a Triple Crown season tagline this year, “enough is enough” is it.